What Does “Tang” Mean When We Talk About Knives? When you're setting up your kitchen or just want an upgrade, the best kitchen knives should be a top priority. No matter how many high-end appliances you possess, a good knife simply has no replacement. 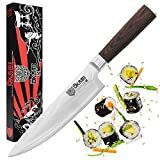 If you can get your hands on the best set of kitchen knives with features that suit your needs, cooking will become a breeze! Many people find cooking to be a daily trial, but it’s amazing how a sharp, durable knife set can make it a more enjoyable task. Of course, the number and variety of knives you have would depend on the level of cooking you’re familiar with. Even if you’re a complete novice at cooking, investing in a few quality kitchen knives is necessary for a well-stocked kitchen. Not sure which ones to go for? 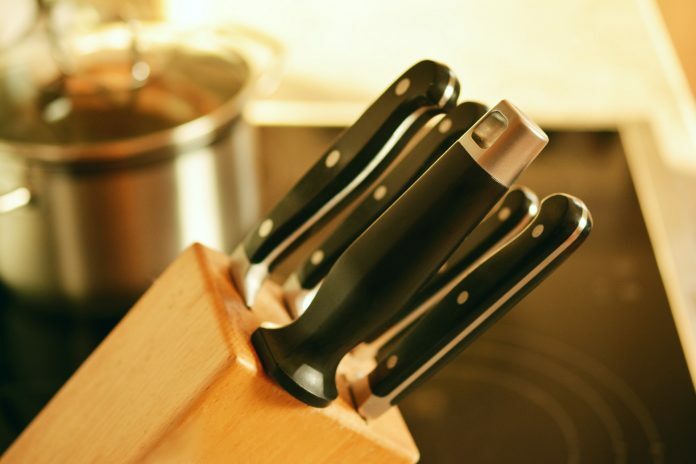 We’ll guide you to the best kitchen knives below! ​If you’re willing to invest the time and cash it takes to use a wide variety of knives, there’s a huge range of options out there for you. Even beginners may have several knives for their meal prepping. 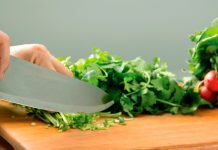 Since you’re probably going to buy a few types of the best kitchen knives, it’s necessary to learn about knife types and the cutting skills that go along with them. We’ll take you through some of the most popular options below. By far the most important knife you can have in a set. It’s usually a wide blade with a tapered point. That allows you to rock it to and fro while mincing. The length could be anywhere from 6 inches to a foot. ​This knife can be from 4 to 7 inches long and is a mini version of the usual chef's knife. Again, you can opt for straight or serrated edges. 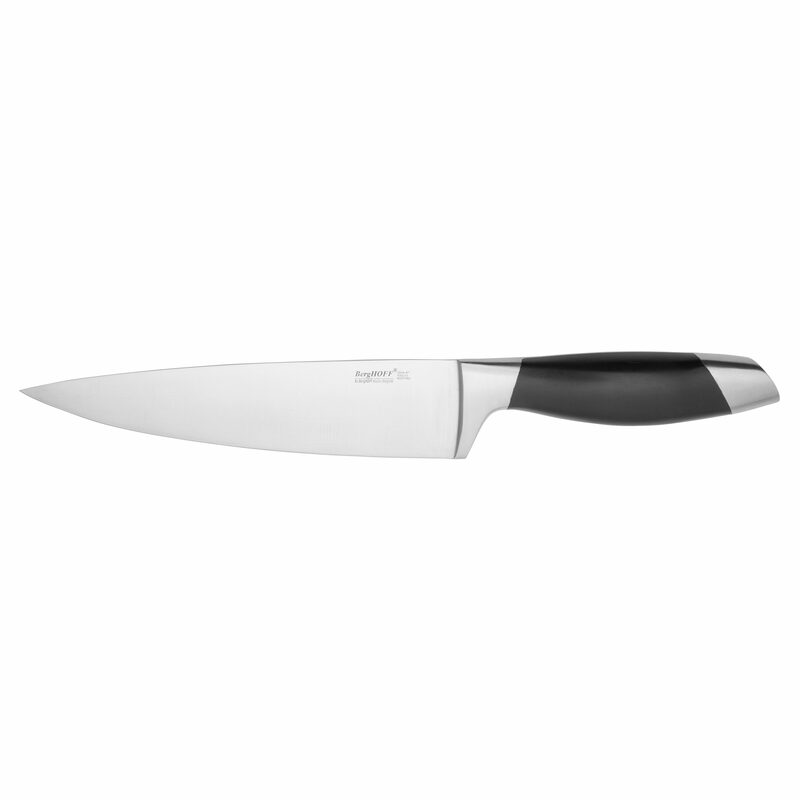 It is the kind of knife that comes in handy when the vegetable or meat is too small for a larger chef’s knife. ​This knife is a Japanese chef’s knife, with the name meaning "three virtues." These three features are mincing, dicing, and slicing. 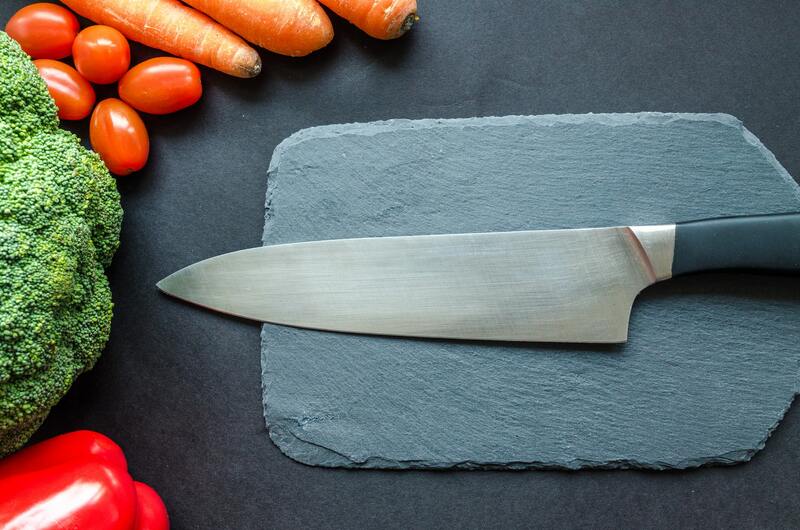 You’ll find this knife has a shorter, thinner blade than a regular chef’s knife. 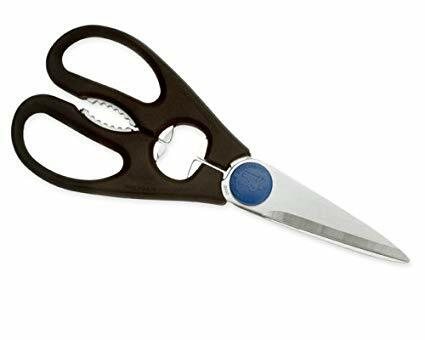 ​These are technically scissors but they are specifically for use in the kitchen. Their uses range from cutting vegetables to making sections of chicken. These shears have very sharp and strong blades that can cut up whatever you need. Some may even have more than one blade to produce a faster result. However, these are usually harder to sharpen and might break easily. 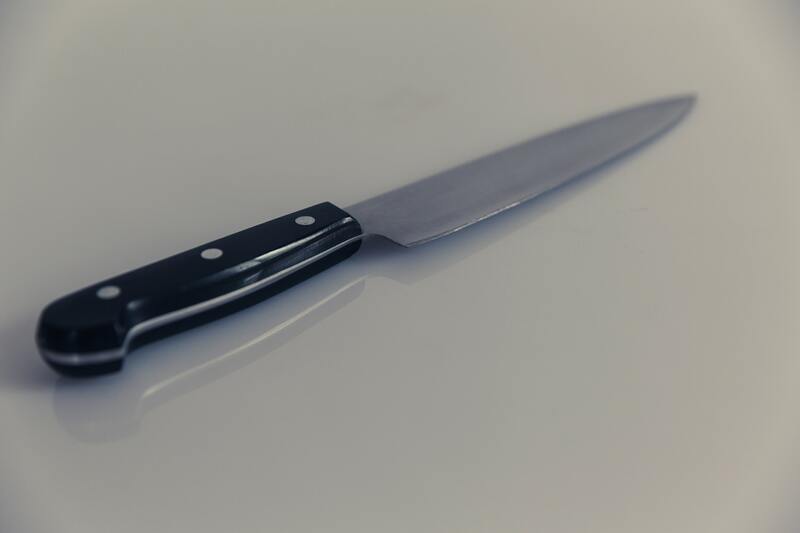 ​If you frequently prepare and cook meat, a boning knife will be handy for removing bones, making fillets, and cutting. Even vegetarians find a small boning knife good for peeling vegetables and trimming out the tough parts. 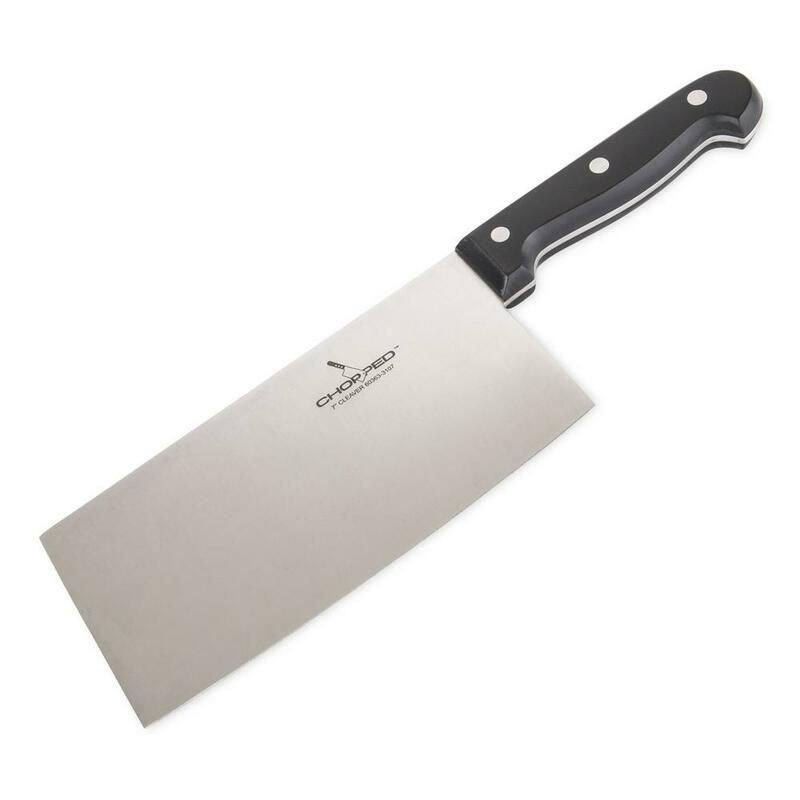 ​As its name suggests, this knife is the best option for bread and cake-cutting. However, it’s also for seafood, poultry, and meat. This type of knife lets you saw away at whatever you need without pushing or squishing anything. ​It is a bulky, weighted knife with a strong blade and a thick spine. This combination allows for cutting bones, meat, or vegetables like squash with a chopping method. ​A paring knife is essential for the garnishes you make for any food or drinks. It has a thin blade around three or four inches long, with a pointy top. It’s usually for peeling and cutting up fruit and vegetables. You can also use it to trim meat easily and precisely. ​These are small knives that you can use for the table. They also come in handy for cutting up fish, meat, salads, and even spreading jam, butter, etc. 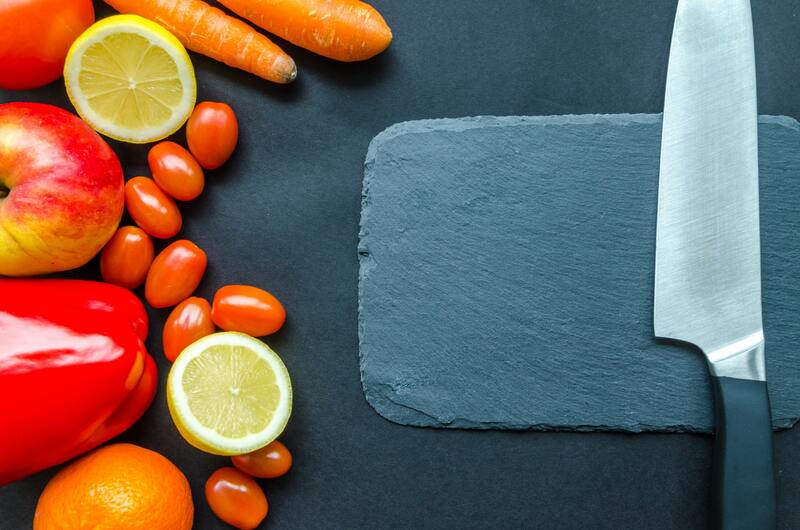 ​When you’re shopping for the best kitchen knives, you may notice their descriptions often include the term "tang." That is the name of the tongue or shank that projects out to connect the knife’s blade and its handle. We’ll take you through the different kinds, so you know what to look for. ​A full tang means that your knife is just one solid piece of metal, with the handles attached on either side. That is the strongest tang type you can get since the blade isn’t going to break off anytime soon. ​A half tang also means that the metal is in one piece, but it gets narrower when the handles come in. The metal part inside the handles is only half their width. ​This is a tang that's pushed inside the handle using glue. Again, there are half push and full push varieties, with the half kind only partway going into the handle. The full push has the tang encompassing the whole handle length. ​This means that the tang tapers down, usually to a threaded rod shape. The rat-tail tang passes through the handle material, and the threaded portion protrudes beyond it. Finally, a threaded pommel or bolt secures the knife’s blade to its handle. ​This kind of tang is small, with a larger handle molded around it. ​The best kitchen knives require some deep consideration. You should check out the following features before you decide on a new purchase. The price range of the best kitchen knives is a huge deal. If you cook frequently, it’s worth investing in a high-quality set. Japanese options stay sharper for longer, so it’s worth spending more on them. Knives are either forged or stamped. The former costs more and provides a better quality, with a blade resistant to bending. The stamped variety is more uniform, but you’ll have to read their reviews to find out how they perform. Forged knives also require more sharpening than stamped ones. A good kitchen knife stays sharp in the long term. That enhances its performance and safety while using. The weight of your knife will determine how comfortable you are with it. You may have to experiment a bit to find the perfect weight that gives you good control. Handle comfort is another major factor to consider. Both factors, though, are based on personal preferences. ​The best kitchen knives are worth the investment, but you have to make sure they stay at the top of their game. Your knife shouldn’t turn dull or damaged anytime soon. Treat it right so you can get the best value from it. Don’t leave any knife inside the kitchen sink. It could get scratched, bent, or broken that way. Plus, anyone washing the dishes might accidentally cut themselves on it. ​Your knife isn’t for mixing with other utensils. It might be broken or dented from all the jostling. 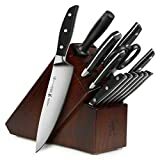 A knife block is the best storage option. 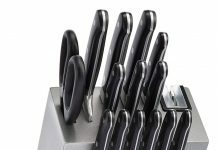 ​Knives aren’t usually dishwasher-friendly. Wash your knife by hand immediately after using and so the blade doesn’t lose its functionality. ​Dry your knife right after washing. That will prevent any mold, mildew, rust or stains. ​Invest in a quality knife stone, honing steel, or a professional sharpening service. Regular sharpening will make sure the best kitchen knives last a long time. 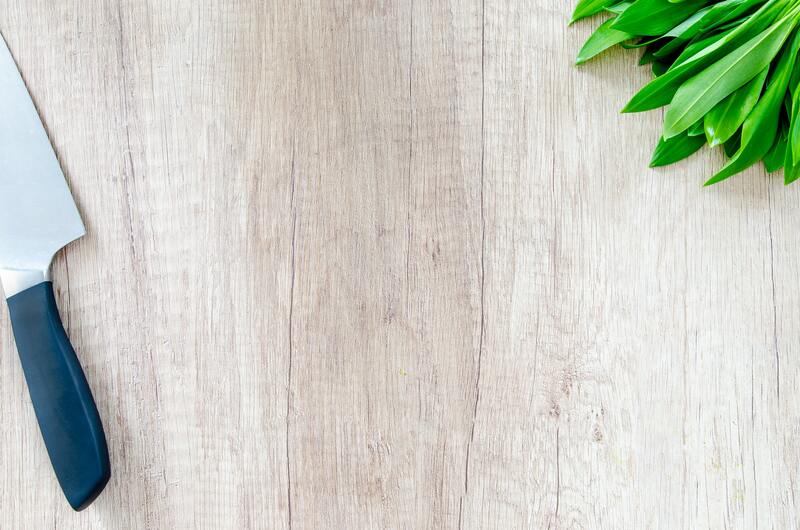 ​Wooden cutting boards are a gentle option for your knife. Cutting on glass, marble or granite will simply put your blades at great risk of breaking and dulling quickly. 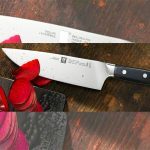 ​We selected the following list of the best kitchen knives based on their brand, features, price range, and customer feedback. This way, there’s something included for everyone who’s on the hunt for the best kitchen knives. You’ll also find that these items have a high rating on Amazon, which should reassure you of their worth. 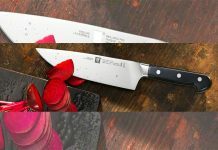 ​We now come to the best kitchen knives of 2018. The options below will let you know just how many great choices are out there! 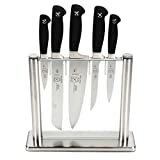 This Mercer Culinary collection is a five-piece set with a knife block made of tempered glass. The knives themselves are high-carbon forged German steel. 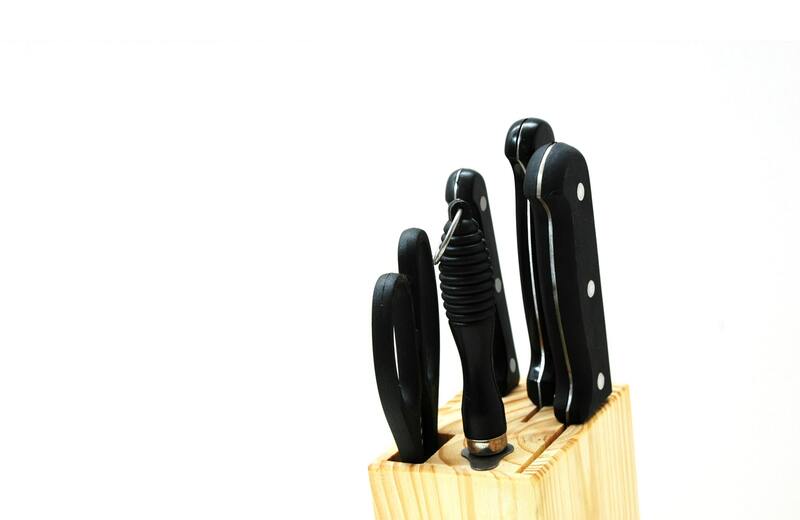 The knives are guaranteed not to rust, stain, or corrode. A brushed rather than shiny finish gives them a unique look. 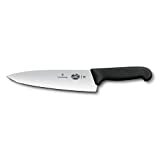 The construction is full-tang with razor-sharp edges, and non-slip handles. Reviewers have praised the excellent cutting ability of these knives. However, this set doesn’t include a cleaver for cutting through bones. This item has an Amazon rating of 4.7 out of 5 stars. This Wüsthof set has three pieces, with full-tang knives in a high-carbon steel variety. These blades are the standard Classic variety with the handles having a tight structure to resist discoloration. A honing rod is best for these blades, not an electric knife sharpener. Customers love the storage box, the durability, and the performance of these knives. However, the forged blades do mean that they need sharpening more often. This item has an Amazon rating of 4.7 out of 5 stars. 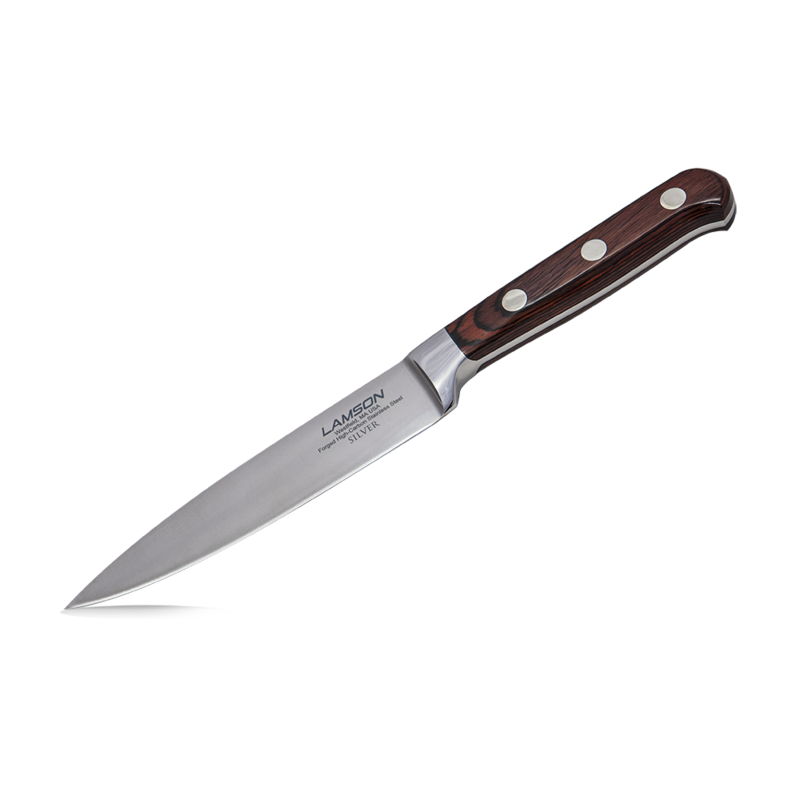 The Chicago Cutlery option is among the best kitchen knives you can find. They come with a wooden block for easy storage and are quite affordable for an 18-piece set. There are even eight steak knives for your dinner parties. The stainless steel handles and the inclusion of a Santoku knife will surely delight the home cook in you. Customers love the sharp edges and variety in this set of knives. However, they all have straight blades with no serrated option. This item has an Amazon rating of 4.4 out of 5 stars. The J.A. Henckels knives are for every kind of use, including sharpening steel, kitchen shears, and a Santoku knife with a hollowed edge. That, along with the natural wood block, will provide you all you need to start cooking in your kitchen. Customers love the variety of knives in this set, but the high price doesn’t make them accessible to everyone. This item has an Amazon rating of 4.4 out of 5 stars. ​This Cuisinart offering is a 15-piece set that comes from a trusted American company. 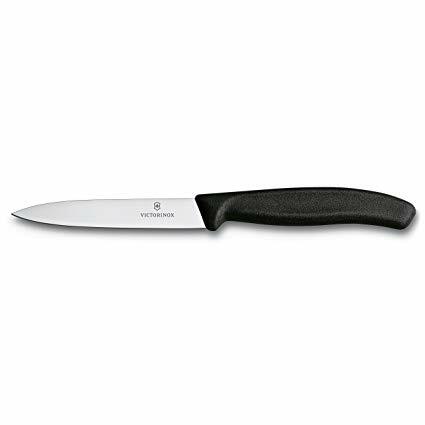 It’s a fashionable model that provides stainless-steel knives with hollow handles. These knives are excellent at cutting cheese, sticky foods, bread, herbs, and whatever else you require. The whole set weighs 8.1 pounds. Customers report that they loved the brushed finish, which lets the handles stay comfortably in their hand. However, they might not be the best choice for someone who wants a hefty knife. This item has an Amazon rating of 4.3 out of 5 stars. 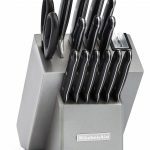 The ZYLISS knife block set is an innovative addition made of German steel. The knife sheaths are antibacterial and have a box for easy storage. The forged blades include a paring knife, bread knife, utility knife, and six serrated steak knives. The black plastic handles are comfortable and easy to operate. Customers love the full-tang knives and their performance, even if the forged blades need frequent sharpening. This item has an Amazon rating of 4.2 out of 5 stars. The BGT knives are dishwasher-safe, but most recommend that you wash them by hand so you can easily preserve their quality. 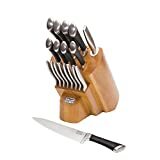 The set contains a paring knife, a Japanese utility knife, a chef’s knife, and a bread knife. 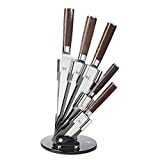 The blades are of stainless steel, while the handles are plastic faux wood in a light color. You’ll get the Rockwell hardness of 58 and a smooth, comfortable holding experience. 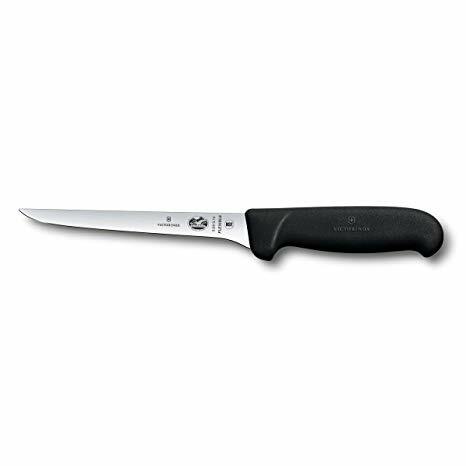 Reviews for these knives have appreciated how easily they prepare meat, poultry, and fish. However, this set isn’t suitable for cutting through bones. This item has an Amazon rating of 4.3 out of 5 stars. 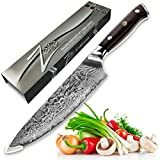 This Zelite Infinity is a professional chef’s knife that’s about 8 inches long. It has a razor-sharp blade with an impressive performance. You’ll also get superior edge retention for a long-lasting run. 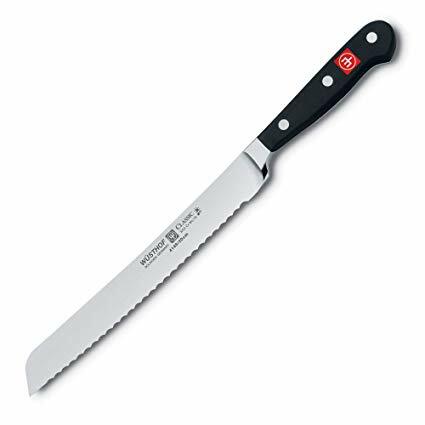 Plus, the blade is resistant to stains and corrosion, so you won’t risk contaminating your food. Customers love the professional quality and looks of this knife. This item has an Amazon rating of 4.8 out of 5 stars. 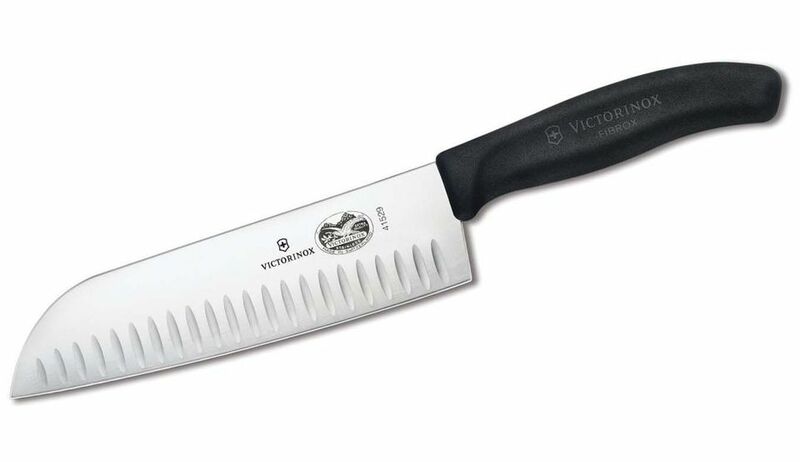 ​The Victorinox chef's knife is for professionals. The ergonomic handle and wide blade are easy to grip. The stainless-steel blade is high-carbon material. There’s a three-quarters full tang included, which makes for a sturdy, reliable experience. Home cooks and chefs alike have highly appreciated this knife. 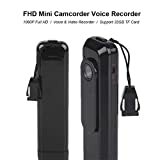 This item has an Amazon rating of 4.7 out of 5 stars and the price range is between $35 and $75. This offering from Ōkami is excellent for vegetables, sushi, sashimi, and meat. You can use it easily in a restaurant or at home while preparing a range of culinary delights. There’s a VG 10 steel core, 67 layers of Damascus Steel, and an elegant blade for every task. Since the steel has cobalt and 1 percent carbon, the edge will retain sharpness for a long time. Customers love the durability of this blade as well as the quality materials. This item has an Amazon rating of 4.7 out of 5 stars. ​The options above are all excellent investments, but you’ll have to look at your requirements and pocket before making a decision. If you just want one all-rounder knife, the Ōkami will give you long-term satisfaction. If you’re on the lookout for a whole set, the Chicago Cutlery set is an affordable option with a huge variety.